winter and Valentine's Day...a Valentine Mitten Card! Your card is so cute! I really like the texture you've added to top of the mitten. I just love your "love" card! 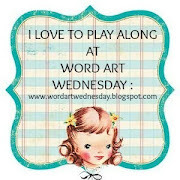 :) TFS at Word Art Wednesday! That is just the cutest, I do love the knitted embossing folder and it is just darling on that mitten, love how you have combined winter with valentines and the faux snow is a cut touch with the snowflake!